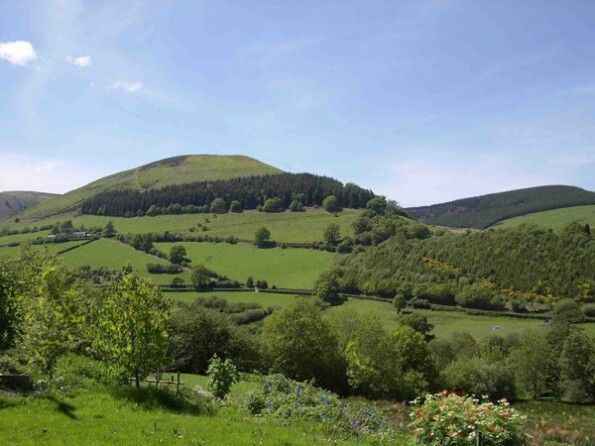 Escape to the Welsh countryside for a luxury holiday amidst stunning scenery. 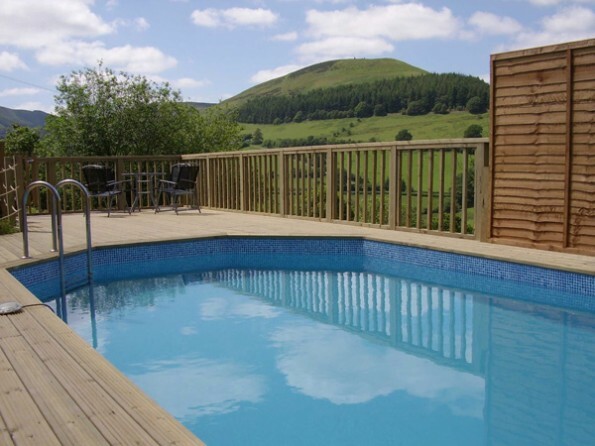 Swim in your own heated pool, enjoy breathtaking views of the Cambrian Mountains, and soak up the peace and tranquillity. 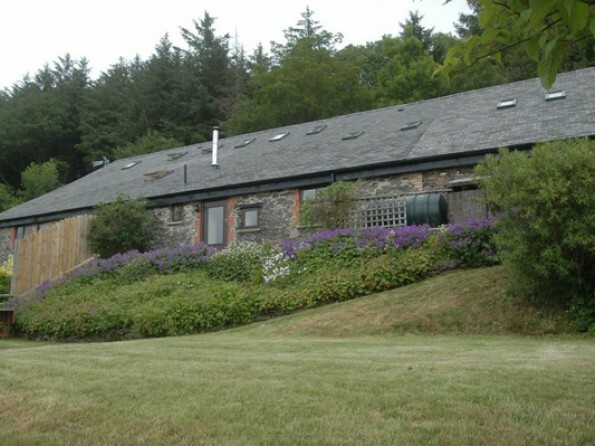 Cae Madog Barn offers spacious luxury holiday accommodation in a blissfully quiet location with easy access to many local activities and places of natural beauty in the stunning scenery of Wales. Try horse riding, fishing, clay pigeon shooting, rally driving, quad biking, bird and badger watching, sailing, golf or mountain biking around the lakes. Visit the historic market town of Machynlleth, where you can explore the world-famous Centre for Alternative Technology. Explore Snowdonia, climb Cader Idris, or visit King Arthur’s Labyrinth. Half an hour’s drive takes you to the beautiful sandy beaches at Aberdovey, Barmouth and Borth, and right on your doorstep you can enjoy the walks and views of the Cambrian Mountains. But of course, with exclusive use in summer of the fabulous outdoor heated swimming pool, you may just want to spend the afternoon floating there, watching the red kites soar in the sky. You are close to award-winning beaches, historic sites and visitor attractions such as The Centre for Alternative Technology, the Machinations visitor centre, Great Little Trains, museums, art galleries, country houses and craft centres as well as a whole host of other exciting places. For the outdoor enthusiast, there are numerous activity and adventure centres, not least Coed-y-Brenin. The Welsh landscape provides superb opportunities for walking. You will find castles, ancient towns and villages, theatres, rare wildlife, historical steam railways and canals, wonderful walks, fabulous golf courses, fishing and shooting. 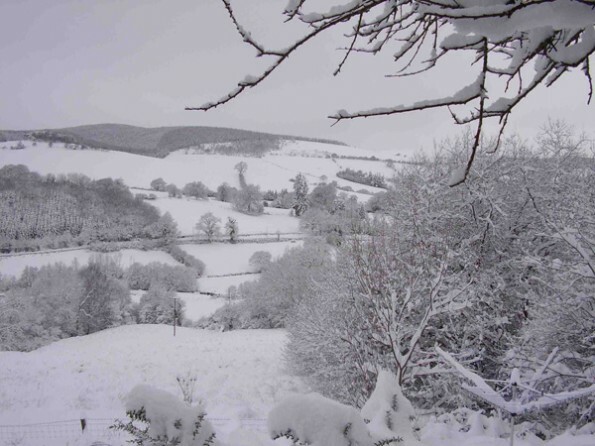 Cae Madog is in a rural location, so is best reached by car. 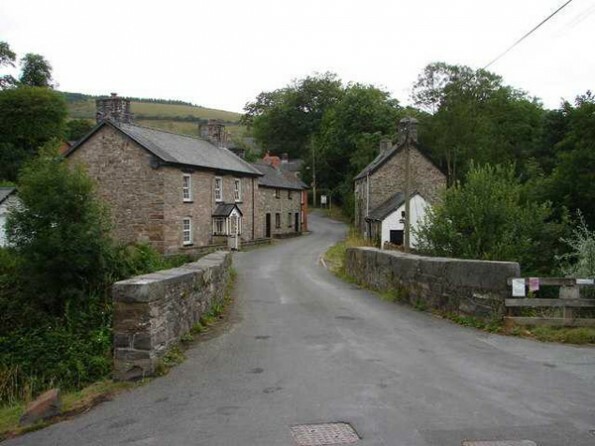 The property is located 4 miles off the A470, via a single-track road. Relax in the large, airy double height living room with its open-beamed ceiling, and spend the evenings cosy and warm in front of the wood burning stove within its inglenook fireplace. By day, the sun streams through the window, through which there are extensive views of the surrounding countryside. The house can accommodate 16 people comfortably in 7 bedrooms: 1 king size, 3 double, 2 twin rooms and 1 children's room with a set of bunk beds. There are four bathrooms (one en-suite, two shower rooms and a family bathroom), a large family kitchen, a second sitting room with DVD and games machine and a dining room with beautiful views of the valley and seating for 16 (plus a high chair). You have exclusive use of the heated outdoor swimming pool. But even when you’re not in the pool, you’ll enjoy the peaceful outdoor space at Cae Madog Barn: sitting on the patio, the Twymyn Valley is spread out before you, with rolling hills in every direction, and you can picnic or have a barbeque in the sunshine. The children are sure to make the most of the detached games room with its pool table. For large parties, there is ample parking with space for up to 5 cars. 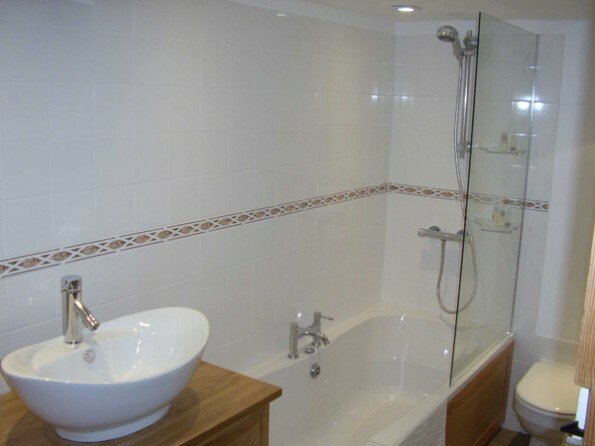 The well equipped kitchen is newly fitted and includes a washing machine, dishwasher, microwave and range cooker. The cosy woodburner in the main sitting room is a great place to gather round on a cold evening and, on a warmer night, leads you out into the garden and pool area. 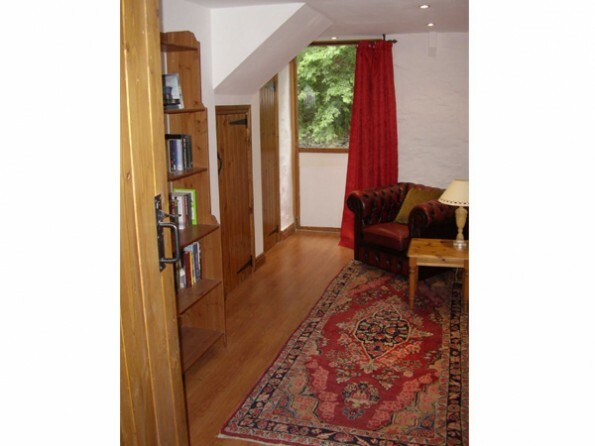 A short flight of steps leads up to a small second sitting room which is ideal as an additional room for the youngsters as it has a TV/DVD and an Xbox with a selection of games. Bedroom 1, downstairs leading off from the study, is a lovely double bedroom with a brass bed. 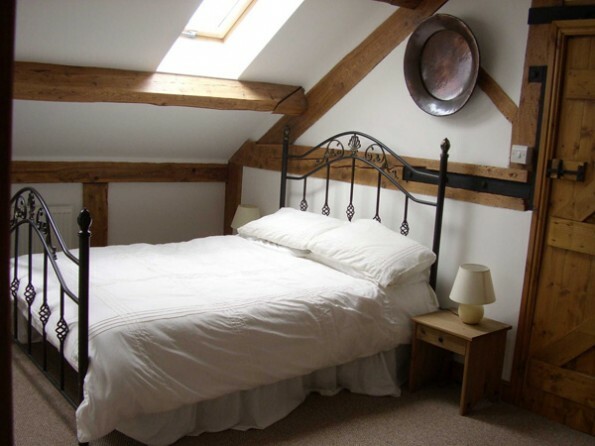 Bedroom 2 is an impressive large room with a double bed, exposed beams and vaulted ceiling. 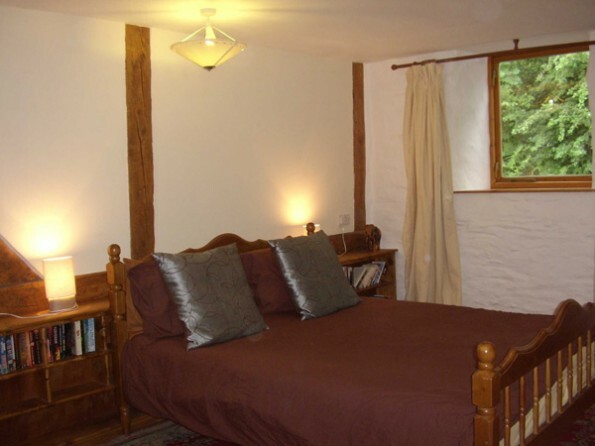 Bedroom 3 has twin beds, feature stone walls and exposed beams. A separate staircase leads from the kitchen to a large first floor landing with two bedrooms off it: Bedroom 4 (a child's bedroom with 2 sets of bunk beds) and Bedroom 5 with a king-size bed and an en-suite bathroom with under floor heating. 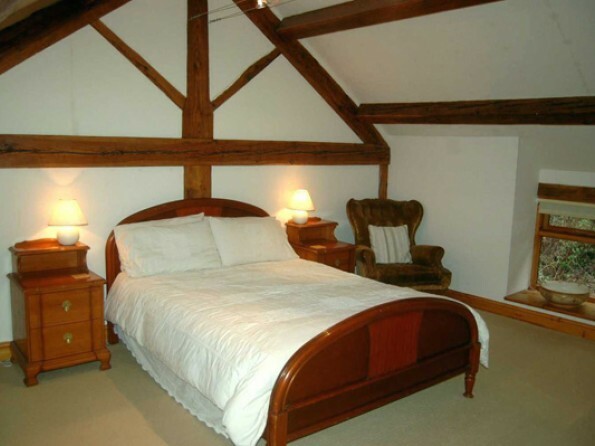 A further flight of stairs leads to two more bedrooms: Bedroom 6, a twin room with 2 single beds and Bedroom 7, a double with exposed beams and a vaulted ceiling. Bed linen and towels are provided but please bring your own beach towels and swimming pool towels. A travel cot and high chair available, but please bring your own cot bedding. 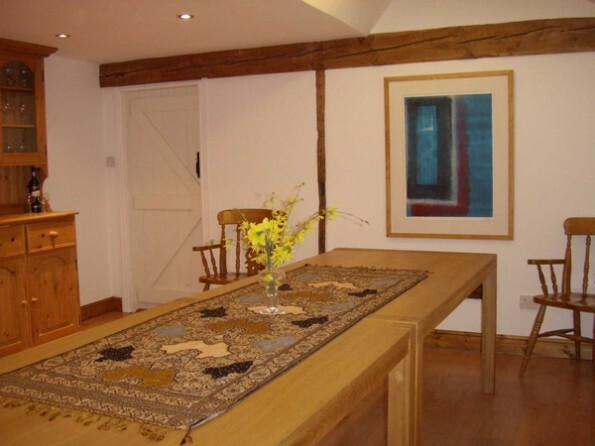 Central heating and electricity are included, logs are provided, and Wifi internet access is available. There is a mobile signal for most networks. 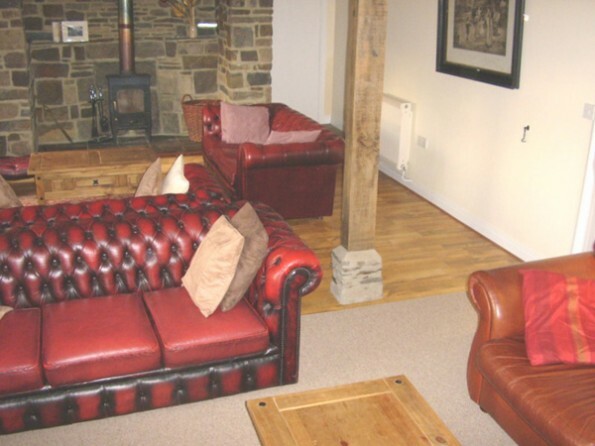 Pets are welcome by arrangement, but no smoking is allowed in the cottage.Please note: Cae Madog Barn is in a quiet rural area and is not suited to hen nights, stag parties or similar.